We love visiting the Wildwood Island which has some of the prettiest beaches in South New Jersey. 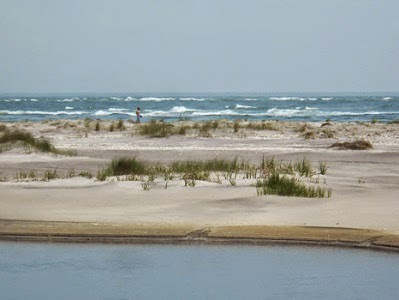 Our favorite part of the island is in the city called North Wildwood which is the most northern section of the island, up by the Hereford Inlet Lighthouse. The Seawall was built a few years ago and starts at the corner of Beach Drive and runs into the village of Anglesea for approximately 1.1 miles. It is one of the prettiest walks and is wheelchair accessible for those who need on/off ramps. 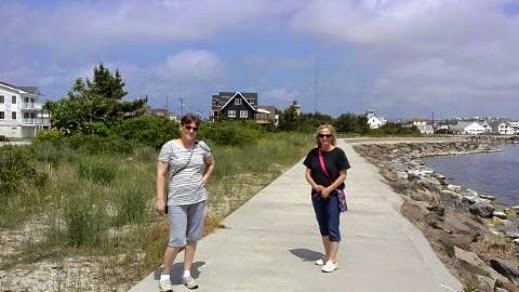 We like to start our walk at Beach Drive and walk the North Wildwood Seawall down to the Hereford Inlet Lighthouse. You can access the lighthouse grounds from the seawall and find many beautiful places to sit on the benches behind the lighthouse & on the wall. Here...you will get some of the prettiest views of the Atlantic Ocean and of Hereford Inlet. After sitting for a bit, we continue on up into the village of Anglesea. Once we are there, we like to stop and sit again just to take in the gorgeous views and to rest a bit. Once we are done, we head back down the Seawall and take the same route back that we came. The North Wildwood Seawall is 100% cement paved so it is great for walking, running, baby strollers and wheelchairs. They do NOT allow skates, bikes or skateboards on the seawall during the "in-season" times of the year. All of the photos featured in this blog post were taken while I was standing on the wall. As you can see...a gorgeous party of the Wildwood island! Enjoy!